11:17 a.m. I haven't written in eleven days but before I break down what happened, I got a dream to tell. It was more like one of those dreams broken up into a series of little dreams one after the other. The gist of it was that I decided, out of nowhere, that I wanted to marry Caleb. I tried to apply blue glitter liner to my eyes, then enlisted April's help with the makeup, until it got to the point where she was trying to have it the way 'she' wanted it, instead of my own way, so I lashed out at her. I ended up doing thin black liner and coming back to apologize to her. So we are planning this super secret wedding that not even Caleb knew about, until I called him and told him that I was planning a wedding for us to take place in six hours....while he was one state over still. He seemed unusually calm about it and said he'd jump on the next flight and be there in a little over an hour. Later, my family showed up and I explained that I needed to go shopping for a dress. Mom explained that my Dad will not be able to make it to the wedding because he was working in Mexico, but he sent his well wishes. I jumped on the back of Mom's motorcycle where I planned to pick out a cheap dress. I originally wanted to go completely casual down the aisle, for the both of us, and then I decided to get something dressy and a nice dress for the reception. We got there, and while I passed some glittering gowns on the racks, we headed straight to the dressing room where someone handed me 90's style clothes, including overalls. I mildly complained and then the owners, the band TLC (including the late Left Eye) showed up and were making comments I cannot recall. The next thing I remember is coming back and Caleb was there, and I gave orders to everyone to hide me as he was not to see me for the first time until I'm walking down the aisle. (In real life, we talked for five years but never met face to face.) I wore a hoodie and in a ridiculous fashion, covered up my face until we got into the house. Then there was this creepy thin goth guys in a suit who was following after me and I remember trying to dodge him, and comparing him to being 'the thing that is Caleb's worst side was another person, it would be him.' There's also some random scene where I'm riding on a river in a motorboat and talking to myself, but idk when in the dream this was. So cut to the bathroom scene, at the end in a red dress and applying mascara, I was talking to the camera about suddenly planning a secret wedding to be held in six hours, where no one, even the groom knew about until after planning started, with a man I had never met and had only spoken to a few times over the years. I spoke rather ironically. Then came the moment where I started walking down the aisle with my 'son' (who was about 6-7, who I had out of nowhere) holding the train. Then we got to the end and he made a joke-able protest and I laughed and said I was glad the decision was not up to him. The dream ends about here before any words are spoken. About the past eleven days. I've been creating and continuously buying Meli Imako's 50L full perm meshes while I still could, before the prices went up (as they have been more and more daily.) We've been grocery shopping, Netflix, hanging out with friends, and my Dad invited me to an upcoming Thanksgiving stay for a few days. I haven't really felt like blogging. Last night, I played a app similar to pictionary with online people while April playing Risen 2, after she could get it to work anyway. The cats have turned my little room into a hangout since I leave the windows open all the time. I do have to shoo them out from time to time in order to get some sleep. April has been home more often, not because she's so much sick anymore, but because her Mom got sick. Wishing all the best for their health, in Jesus name, amen! Finished the series Stranger Things again as well as Luke Cage, and really enjoying the new season of Supernatural. I've had my share of weird dreams over the past couple weeks, most I'm glad to forget, but this is one that I really felt like writing. I'm half tempted to tell Caleb himself. I remember this, the day my name got written in the snow. 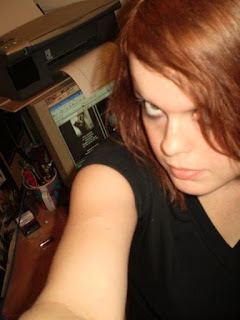 This was me at 19, in 2008, which was probably the prime time of that relationship. Psyclon Nine band proudly displayed on the myspace profile in the background. 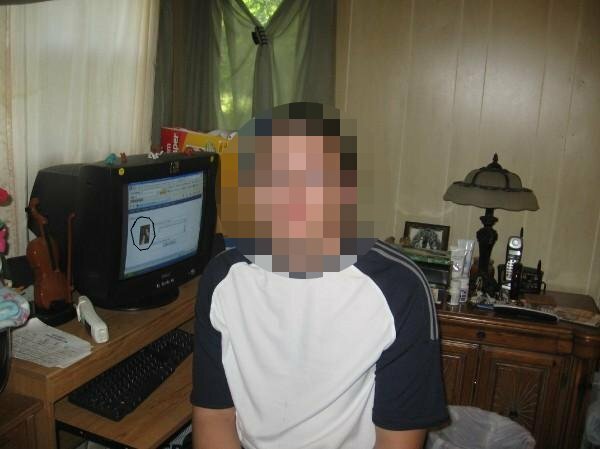 Same profile picture on the myspace message page in the background. Pixeleted by me for privacy sake. I found myself asking why I keep this kind of stuff, if its even a little creepy, (I do keep a lot of old photos) but I think I'm just very nostalgic about that time, not for all of it, certainly, but for a time where I felt in love. I haven't been in love again since I broke things off at 21, around 7 years ago. It was tolerable when I was a completely different, if not worse, person than I am now but it wouldn't work with my current self. Even though we were never physically associated in the five years we got to know each other, looking back that was enough to know what went on between us was NOT healthy or okay, and dangerous at times. This was just a dream, written up there, an ideal. 12:03 p.m. I did the weirdest thing. We still keep in touch now and then on facebook and I went ahead and confessed where I got the photos. Hope he doesn't mind. O.O If you're wondering, it was off a seriously old myspace profile. P.S. Hope you're not judging me. Admittedly, though I still wouldn't pursue a relationship, the things that happened back then leave me deeply connected to that part of the past and some of the pictures leave a fine impression.